Is Jason Van Dyke Still a Chicago Police Officer? Nearly four years after a Chicago police officer was captured on dashcam video shooting a teen 16 times on the city's Southwest Side, a trial date has been set in the high-profile case that sparked widespread outrage and calls for reform. While public outcry sparked the firing of then-Supt. Garry McCarthy, as well as the electoral ousting of former State's Attorney Anita Alvarez, the man at the center of the controversy - the officer who fired the fatal shots - has not officially been fired from his role as a Chicago police officer. Jason Van Dyke was charged with six counts of first-degree murder in November 2015, and 16 counts of aggravated battery in March 2017, in the death of 17-year-old Laquan McDonald. Van Dyke entered a plea of not guilty. Supt. Eddie Johnson filed a motion with the Chicago Police Board in August 2016 to discharge Van Dyke from the force on the grounds that he violated six rules and regulations of the Chicago Police Department. Those rules included "any action or conduct which... brings discredit upon the Department," "disobedience of an order" and "making a false report," among others. Johnson filed termination charges for four additional officers - Daphne Sebastian, Janet Mondragon, Ricardo Viramontes and Stephen Franko - in connection with the case, accusing them of various violations including making false reports about what happened the night of the shooting. In June 2017, the Chicago Police Board granted a motion to stay the proceedings in all five cases "until the pending criminal case against Officer Van Dyke and the pending grand jury process involving the other officers are completed." Adding a layer of confusion, a CPD spokesman initially said when asked Tuesday that Van Dyke had been "separated" from the department, then clarified his status as an officer was "suspended" until the criminal case is completed. 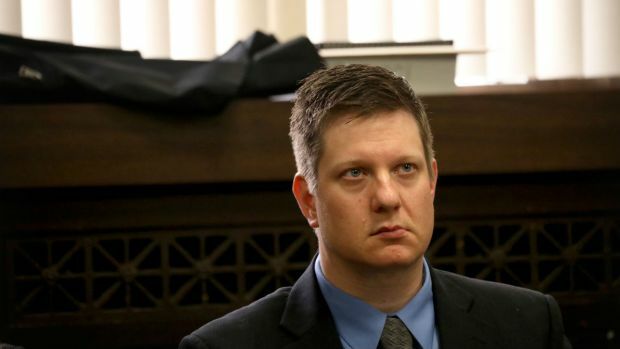 Thus, Van Dyke remains a member of the Chicago Police Department - suspended without pay - until there is a verdict in his trial, now set to begin Sept. 5.